COCOREX Colours - Goodmaid Chemicals Corporation Sdn. Bhd. Non-chlorine, oxygen based bleach that brightens colours and removes stubborn stains. • Brightens colours and keeps clothes looking new. • Formulated with unique stain-removing properties, it penetrates deep down to remove stubborn stains while protecting colour. • Suitable for all washable fabrics. 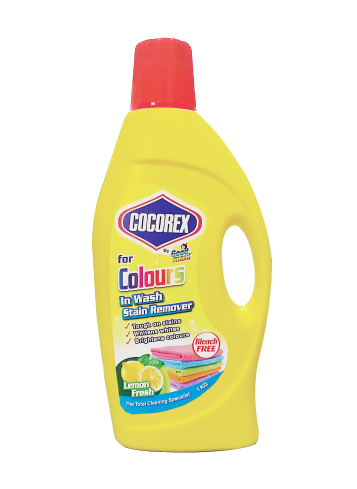 • Add 40ml COCOREX Colours with detergent into 5 litres of water. 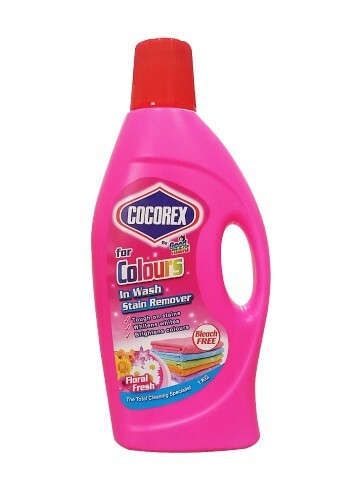 • Add COCOREX Colours with detergent before adding clothes. • For large loads, large washers and heavily soiled loads, use 80ml. • For regular / small loads and regular washers, use 40ml. • Apply COCOREX Colours directly onto stain. • Rub gently and wash promptly. • Pour additional COCOREX Colours with detergent and wash as usual. • Do not allow product to dry on fabric.